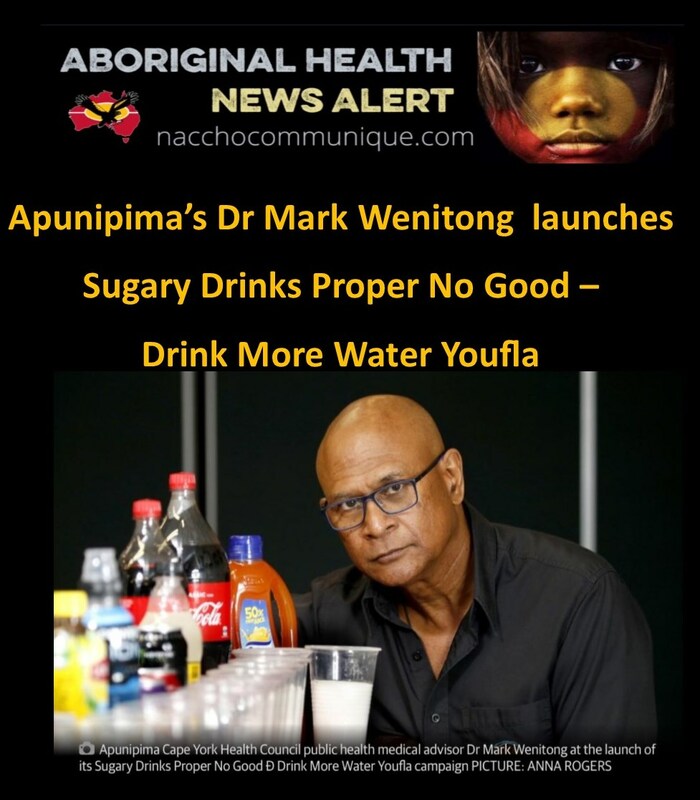 Apunipima Cape York Health Council launched its Sugary Drinks Proper No Good – Drink More Water Youfla social marketing campaign on Thursday 2 November. The campaign was developed with, and for, Aboriginal and Torres Strait Islander people of Cape York, and is supported by the national Rethink Sugary Drink Alliance – a group of organisations, including Apunipima, Diabetes Australia and the Cancer Council, concerned about the health impacts of sugary drinks. The launch will see the campaign webpage (part of the Rethink Sugary Drink website) go live, and the release of three videos featuring NRL legend Scotty Prince inviting people to Drink More Water Youfla. Media was invited to Apunipima’s Cairns office where the three clips were distributed, a sugary drinks display set up, and Apunipima Public Health Medical Advisor Dr Mark Wenitong was for interview and photos opportunities. ‘This campaign is straightforward – sugary drinks are no good for our health. It’s calling on people to drink water instead of sugary drinks like soft drinks, sports drinks and fruit drinks,’ Dr Wenitong said. Head of Prevention at Cancer Council Victoria and spokesperson for Rethink Sugary Drink Alliance Craig Sinclair said Apunipima’s campaign was prevention – focused and could save lives. The campaign was funded by the Australian government via the Northern Queensland Primary Health Network (NQPHN). ‘We’re pleased to be supporting Apunipima in this comprehensive health promotion initiative to address consumption of sugary drinks, which are one of the key contributors to overweight and obesity,’ said NQPHN CEO Mr Robin Moore. A PROMINENT doctor has reignited calls for a sugar tax, in order to prevent the Far North’s chronic disease rate from climbing even higher. 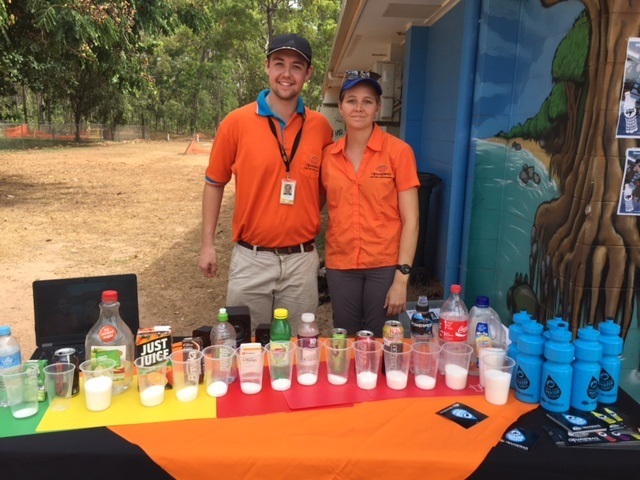 Apunipima Cape York Health Council has launched a federally-funded social media campaign, to discourage Aboriginal and Torres Strait Islander people from consuming sugary drinks. 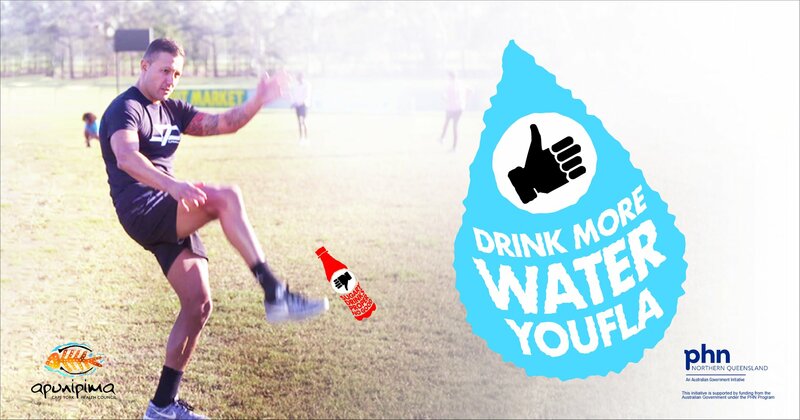 The “Sugary Drinks Proper No Good — Drink More Water Youfla” campaign, featuring videos by NRL legend Scotty Prince. It calls on people to drink water instead of sugary drinks, like soft drinks, sports drinks, and fruit drinks. The campaign has been launched to tackle the high rate of chronic diseases in the Far North such as Type 2 diabetes and heart disease. Apunipima public health medical advisor Dr Mark Wenitong said a sugar tax placed on junk food and beverages would go a long way to helping reduce this rate. “We’ve seen this happen in a few South American countries, in Mexico,” he said. “If those countries can introduce (a sugar tax) as a health benefit to their population, then I don’t see why we can’t. “I know the beverage industry will often say ‘this will affect the most disadvantaged people, because they’ll have to pay’, our answer to that is, it’s killing most disadvantaged people already, because they’ve got higher risk factors. Cairns Hospital, earlier this year, became one of the first hospitals in Queensland to implement strategies to restrict patient and staff access to soft drinks. Vending machines and the two cafes at the hospital only sell sugar-free soft drinks. Dr Wenitong said the Cairns and Hinterland Hospital and Health Service should go an extra step by restricting other junk food being sold at its facilities, like chocolate bars and chips. “At some stage, I think they’ll have to think about the accessibility of those things, particularly for younger people,” he said. CHHHS executive director Tina Chinery said they had received no complaints from patients, staff or visitors when their healthier drink strategy was rolled out earlier this year. “Healthcare facilities play an important role in promoting the health and wellbeing of patients, staff and visitors,” she said. Yes sugary drinks are bad for health, BUT so is undrinkable water. There are too many places where the only available water is contaminated. Filters and other methods to supply clean water are needed already. Please act for clean water.